The Cedar Creek Brewery announced today the latest beer in their Special Release series. 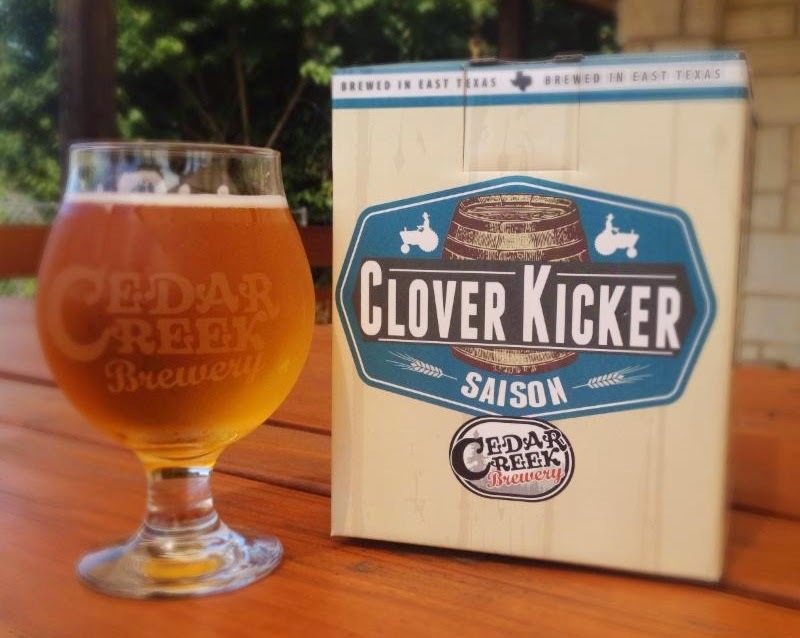 Clover Kicker Saison follows Spinning Mule and their award-winning Belgian Style Dubbel in becoming the third product in this limited line of brews. According to a press release, Clover Kicker is a rustic farmhouse ale brewed with traditional Belgian malt and fermented with a Belgian yeast strain. The latter provides "spicy, earthy [and] fruity notes," resulting in a beer with complex aromas and a "dry, satisfying finish." Clover Kicker will begin hitting tap walls in Dallas within the next few days, with package products expected to arrive at area retailers as early as next week. Markets outside the Metroplex should start seeing deliveries during the second week of October. As with other beers in the series, Clover Kicker will be sold as a boxed four-pack of 16-ounce cans. Try Clover Kicker this Friday, September 26, at the Whole Foods in Colleyville during a tasting with the brewery from 5-8 p.m. The beer will also be on tap Tuesday, September 30, at Alamo Drafthouse Cinema in Richardson. That night Cedar Creek will be the featured brewery for Alamo's monthly Hopped Up Cinema series. In addition to Clover Kicker, the brewery will also bring along a special one-time release as an exclusive for the event. Danker Zone, as it's being called, will be a version of Dankosaurus IPA brewed with additional hops and fresh rosemary.